Ajustamos nuestros parámetros a la naturaleza de cada grupo. Estimados podemos recibir grupos e incluir servicios de transporte, alimentación . Hola! Welcome! Come and make yourself feel at home. Enjoy an authentic stay in the Centro Historico of Quito Ecuador. Our hostel is owned by a friendly, hospitable Ecuadorian Family. We are a nice hostel fit with all the amenities to make your stay enjoyable. We can accommodate single travellers, couples and large groups. We are located one block from the heart of the Centro Historico. Museums, plazas, churches, shopping and sightseeing are all at your fingertips from our location. You can enjoy hanging out in our common room, watch TV and movies on our flat screen, grab a book from the exchange, or socialise with other travellers. We can arrange professional Spanish classes for you as low as $4.50 per hour and then you can practice with our staff! Tours are available to the most popular places with us. We will be glad to help you with directions to wherever you would like to go. We also have a transportation service including airport transfers, tours and even a big yellow bus to take you to your favorite party spot in the Mariscal! 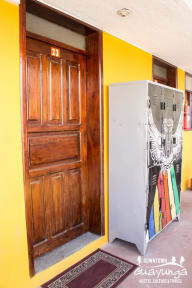 At our hostel we have services such as free internet, inexpensive laundry service , tours, (a yummy) restaurant, and beer and snacks for sale, also computers. Don't forget to check out our rooftop terrace for a breathtaking view of Quito! Hope to see you soon! English and Spanish are both spoken here. Possible early check in available (please call) otherwise check-in: 1:00 p.m. / check out: 11:30 am. I loved staying here and I ended up staying 4 days. The breakfast was enough to get you going, the staff is very friendly and the rooftop patio is complete bliss. It's beautiful. The hostel has a family vibe and you can keep to yourself or mingle. Most importantly the rooms, beds and washrooms were clean and they have hot water. Would definitely go back. I've stayed 4 days at La Guayunga and I enjoyed it. The staff is helpful. Very clean. 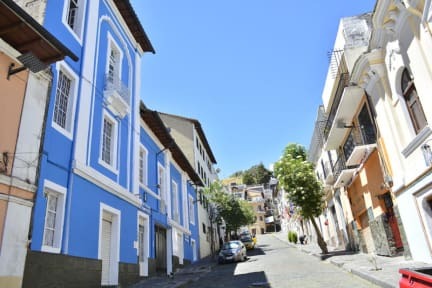 Only 5 minutes walk from the city center (Basílica del voto Nacional, Plaza de la Independencia). I recommend it. All good. No complaints. Will stay again. A rambling fun hostal, very busy and upbeat with young travelers. Rooms were basic but clean, good central location. Very friendly and helpful staff. Decent hostel in a great location definitely take advantage of the free walking tour. Staff were very welcoming and even helped me out with some coca leaves when I got sick. The free WiFi was working most of the time, the free breakfast isn't very big but it's decent enough. The rooftop bar is amazing it is just a pity I was sick when I stayed, it seems like a good place to have a bit of a party. My only complaint is that the toilet locks are terrible hopefully they fix them soon. My boyfriend and I stayed there one night. We had made a reservation for a room with private bathroom, but when we got there we were led to a room with our bathroom, so we said that, and then we were showed another one, but it smelled so bad in there and it seemed like a basement room, so we took the one without bathroom. The windows in our room could not be closed, and it was just not a really good experience, and we just did not find it a very nice place. Poor value for the money. Rooms smelled musty and weren't very clean. It was cold and there was no ventilation so after a shower the room was humid for the rest of the stay. Loud music until midnight, had to pay extra for a complete breakfast. It's hard to get a taxi in the area and staff was not very helpful with this. Beware, hotel accepts credit cards but charges 14% on top of the price paid plus deposit for booking online. You can find a much better place for this price in Quito.